Dilli walo ki Dilli. A beautifully, polluted city, with its noises, midnight weddings, and of course varied people and cultures. A mini India on its own, here lies the famous Delhi University. A University, that many aspire to live ‘the’ college life in. A University that attracts thousands of students from all over India and to the students from Kerala is no exception. Like everyone else who comes to this interestingly unorganized mess, the Malayali ventures forth, not knowing the language or the culture, mostly because of an uncle or aunt that migrated years ago. Otherwise in hopes of seeing places beyond home beyond the watchful eyes of his/her parents. Struggling to fit in and learn the language otherwise fitting in too well. Being a Malayali in DU means you are not alone. There is and always will be a Kerala fraternity to look after you. A community that you somehow become part of, not even realizing that you never stepped out of your birthplace “The God’s own country”. One leaves Kerala, only to be back here again. The Malayalis have and always will remain in DU. They are leaving behind their cultural legacy. A reminiscence that shall follow. The community has not only become an integral part of the university campus but has also contributed immensely to its growth. The Malayali community has been successful in establishing literary circles and societies on the campus. An apt example would be Maithry an organization started by a few Stephenians in 2015 and has been active till now. It has a democratic election that includes every single Malayali in DU, who are democratically elected. The members of Maithry provide help desks to make it easier for Keralites to have smoother admissions all around the DU Campus. It also organizes Freshers for the students. Maithry was able to contribute around ten lakh rupees in the chief minister’s relief fund for Kerala Floods. It also organized Onam an ethnic festival of Kerala, which had Mr. Shashi Tharoor as the chief guest. 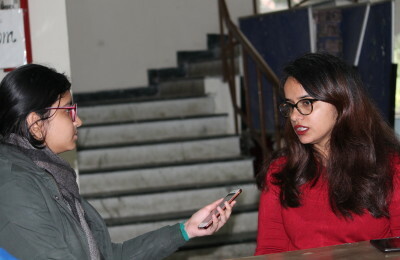 “Maithry was also able to provide scholarships to six students last year that included their annual fees, an initiative that we began in memory of two Malayali students who passed during their college here in DU,” informed Mr. Mehroof, the president of Maithry that that is the Malayalai Student’s fraternity, Delhi University. Being a mallu in DU is equivalent to being in a world of its own with its own differences. There seemed to be a subtle difference amongst the community with respect to the community. A faction referred to as, the Delmals. The individuals, who are born and brought up in Delhi being Malayalis. The chemistry between these two kinds of people may at times be not the most perfect but they do learn to live together though having cultural difference despite having the same identity. The simple fact cannot be overlooked that each Malayali will have his own subjective differences with respect to the experiences gathered from their college lives. One thing is but certain that no matter what, the Malayali community in DU has always been together in supporting homesick students, helping them find another home here and spread the Malayali “thanima” all around, for many more years to come.